Busy busy! Taking advantage of a sunny MLK Day holiday (after doing a little storm clean-up from last night) I figured I'd get a few new accessories installed before taking the car out for lunch today. Nothing too fancy or exciting. 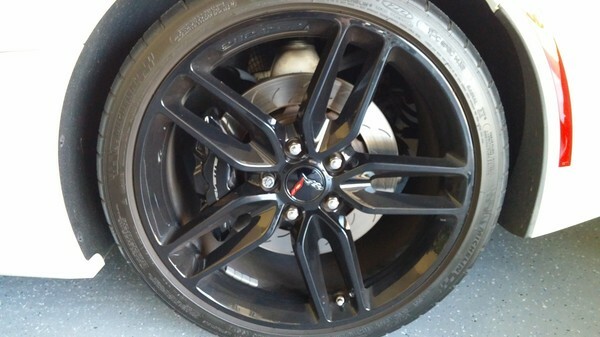 First up were new wheel center caps in carbon flash metallic instead of the standard chrome (ring & badge). These match the rest of the badges on the car now after adding those about a year ago. Then, to match the one I already did I the driver's side last summer, I installed a D.E.I catalytic converter heatshield on the passenger side primary cat. The main thing it this one should shield heat from are the dry sump oil lines running to/from the pan. Are you storing yours in your garage at home, or elsewhere, for the winter? Final piece of chrome trim to be removed! Why they used so much chrome on the C7 is beyond me. The old dudes love it! It's pretty funny on the forum, all the older guys want the chrome wheels/trim/badges while the younger ones all want the black/carbon flash. Looking good! But you know me I am anti chrome! I'm with Rosey on the anti-chrome. 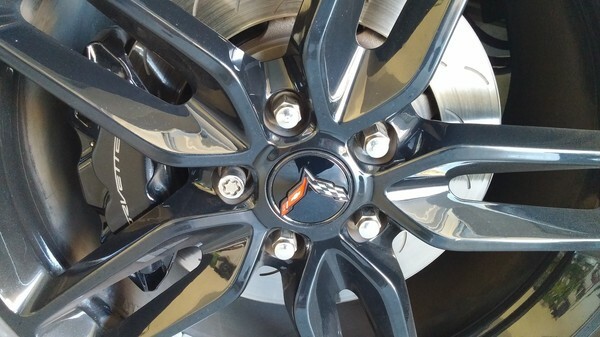 I guess I'm still young, I swapped out my chrome lug nuts for black last fall. 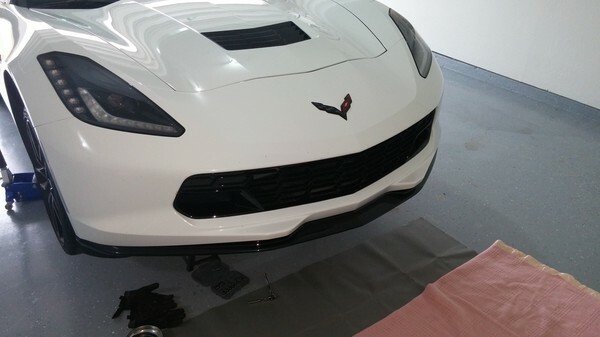 This morning I decided to spend an hour in the garage to install the Z06 stage 1 front splitter. From the factory they are a dark gray plastic, but this one was painted in Carbon Flash Metallic to match the grille, badges, hood vent, etc. The install wasn't too bad; time consuming more than anything. It reused 12 existing bolts, then I had to drill holes for an additional 10 rivets (thank you trusty $5 Harbor Freight rivet gun!). Some guys aren't doing the rivets, but I figured I would go for the full OEM installation since it is an aero part and sees pretty good forces at speed. 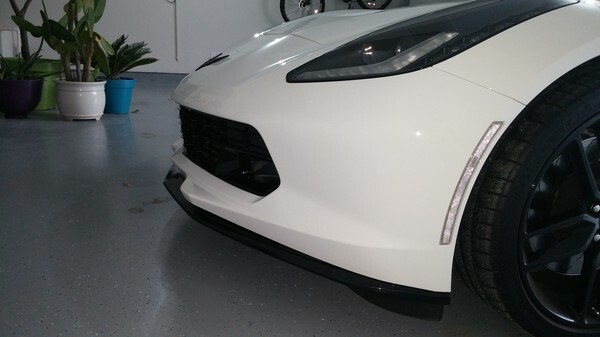 Up next, another day, will be the ACS Zero1 sideskirts to complete the look! Nice! I'll have to buy this from you when you jump to the next platform. Coming full circle so to speak. Looks nice! still think you should have had a beer to complete your presidents day modding. I agree, picture is rather empty haha, looks good! That lip is subtle yet nice.